This was an intriguing, beautifully written and presented book that perfectly captures the tone of the era in which it is set: 1824. The narrative, in the voice of a very likeable police constable Samuel Plank (what a solid and dependable name! ), kicks off with the arrest of a senior banker, Henry Fauntleroy, who soon admits forgery. The rest of the novel is largely spent investigating why he should have risked all to commit his crime. Although it seems like a straightforward case, there are twists that I didn’t see coming, and this unusual approach makes for a very satisfying read. It is also a fascinating portrait of a critical period of development in the banking industry. The new “technology” of the banking industry is paper documents rather than money, viewed with suspicion by many. 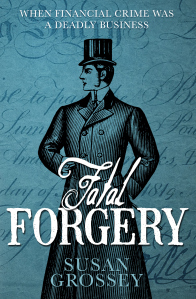 Shockingly, the punishment for forgery is death, which adds further weight to the reader’s need to know just why on earth Fauntleroy would commit it and so readily admit his guilt. The story reads as a compelling analogy to the age of 21st century banking and the modern media’s attitude to “fat cat” bankers. Though we may no longer see thousands of people thronging to the public executions of bankers, the public clamour to read about any banker’s fall from grace provides an echo of that bygone trend. Susan Grossey, the author, is apparently a money-laundering expert in her day job – expert at preventing money-laundering, that is – which accounts for her ease and fascination with financial and legal detail. Sometimes the explanations in the book went a little over my head, but that may be more a reflection of my natural ostrich tendencies when it comes to financial considerations, rather than being a criticism of the author. This still make for a very interesting read. 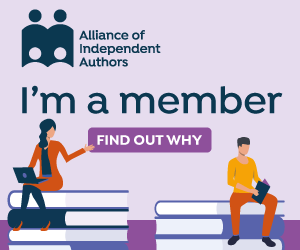 All in all, a remarkable debut novel. While I won’t be reading Ms Grossey’s non-fiction books about money-laundering, I’ll definitely be looking out for more of her fiction, and I’ll be recommending this book to members of the local Historical Novel Society book group that I attend.